Pennock Plumbing & Heating, "Family Owned & Operated", has been providing quality and dependable plumbing and heating services since 1987. 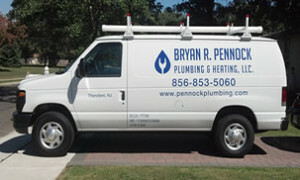 In addition Pennock Plumbing & Heating also provides drain cleaning, and kitchen & bathroom remodeling services residents & businesses in Camden and Gloucester County, NJ. Call (856) 853 – 5060 or CLICK HERE to request your "FREE" estimate today! Over the years our customers have come to count on Pennock Plumbing & Heating for honest pricing and dependable work, and we know you will too. Whether you need plumbing or heating services, a water heater, a drain cleaned, or your kitchen remodeled, we'll get the job done right the first time! Pennock Plumbing & Heating offers competive pricing on all plumbing and heating services. We won't try to sell extra work you don’t need! Properly Bonded, Insured, and Licensed for Peace of Mind!